Can I use Psychology Tools resources in my professional work? Members who have a valid ‘Professional’ or ‘Team’ subscription are licensed to use and share Psychology Tools resources with their clients. Members with a ‘Trial’ account are licensed for personal (self-help) use only. Can I download Psychology Tools resources for personal use? Anyone is welcome to create a ‘Trial’ account download resources from Psychology Tools for personal use. Members of the public may find the ‘Self-Help’ section (accessible from the main menu) more immediately helpful. Always bear in mind that this site is not intended to be a substitute for professional medical advice, diagnosis, or treatment. Always seek the advice of a physician or other qualified health provider with any questions you may have regarding a medical condition and/or medical symptoms. Never disregard professional medical advice or delay in seeking it because of something you have read on a website! If you think you may have a medical emergency, call your doctor or the emergency services immediately. Can I share the resources? As an active subscriber to a Professional plan you are granted a license to use Psychology Tools resources personally, or in the course of your clinical work with clients. You are authorised to share copies with your clients, but there are restrictions on other uses. If you are unsure about whether your planned use is authorized please see the full terms or contact us for clarification. As an active subscriber to a Team plan you and the named members of your team for whom you have purchased a license are granted a license to use Psychology Tools resources personally, or in the course of your clinical work with your clients. You are authorised to share copies with your clients but there are restrictions on other uses. If you are unsure about whether your planned use is authorized please see the full terms or contact us for clarification. Can I put Psychology Tools worksheets on my own website? No. Psychology Tools materials must not be hosted on external websites. Can I try the resources before I sign up? Yes, if you create a ‘Trial’ account you can download 5 worksheets for inspection use. What happens at the end of my subscription period? Subscriptions to Psychology Tools renew automatically by default. If you want to alter this setting then log in to your account page and turn ‘Auto Renew’ to ‘off’. If you turn Auto Renew off then your subscription will expire at the end of your subscription period. Once your subscription expires you will not be able to download Psychology Tools materials, and you will no longer be licensed to use any resources you have already downloaded. What if the price goes up? Members are protected from any price increases. We guarantee that the price you signed up for is the price you will pay for the lifetime of your subscription. As Psychology Tools is a digital service refunds are not offered. If you would like to try the resources before you pay for a subscription you are encouraged to sign up for a ‘Trial’ account. Why can I see an additional charge on my bank statement? Psychology Tools is based in the UK. Some banks will charge their customers an additional ‘foreign transaction fee’, typically between 1% and 3% of the purchase price. Are payments to Psychology Tools secure? Yes. Psychology Tools uses Stripe, one of the world’s largest payment processors, to securely handle payments. Psychology Tools does not store your payment information. Can I share my login details? No. Only the subscriber is licensed to use the resources. You must keep your login details secure. If you have colleagues who wants to use the service then use our ‘refer a colleague’ feature or consider purchasing a team subscription. No problem. Go to the login page and click ‘Forgot Password’. You will be prompted to enter the email address associated with your account. After you submit this you will receive an email with instructions on how to reset your password. Sometimes the password reset emails get caught by your spam filter – so do check your junk mail folder. I’m a therapist, is it safe for me to use the techniques I learn here with my clients? Mental health professionals are bound by their professional codes of practice. As a professional user you should work within the bounds of your own competencies, using your own skill and knowledge. 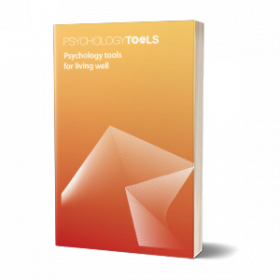 Psychology Tools resources are intended to support good practice, not to replace it. Is it safe for me to download Psychology Tools resources for personal use? We don’t have any reason to think that Psychology Tools resources are inherently dangerous. Knowledge is power, and this is especially true when applied to our mental health. That said, this site is not intended to be a substitute for professional medical advice, diagnosis, or treatment. Always seek the advice of a physician or other qualified health provider with any questions you may have regarding a medical condition and/or medical symptoms. Never disregard professional medical advice or delay in seeking it because of something you have read on a website! If you think you may have a medical emergency, call your doctor or the emergency services immediately. These resources are great, can I translate them into my language? Yes please! We welcome translations from practising therapists. Check the ‘translation project’ page to see which resources are waiting to be translated.